This is tall wooden vintage glass display case. This glass display cabinet brings an elegant and professional aesthetic to any retail area. The large glass area allows the maximum amount of ambient light into the display case to illuminate the products. There is a locking door to help keep your products safe from theft in this vintage glass display case. There is also one 50 watt halogen light to keep items visible at all times and conditions. There are three adjustable shelves in this display case making it easy to customize. Shipping: This product is ships pre-assembled. This tall wooden vintage glass display case saves space due to its vertical design. The display case is also constructed of solid wood materials which make it extremely durable and stable. We also build custom wooden tall display cases if this design does not fit your requirements exactly. 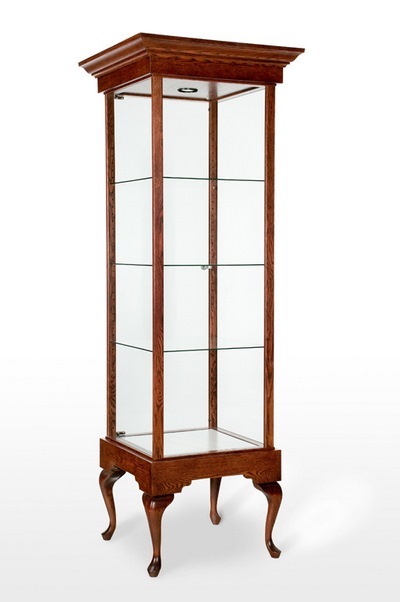 Click here to view the full line of custom finishes we have available for this tall wooden vintage glass display case.